For Halloween I just had to watch a Halloween film, a no brainer really. 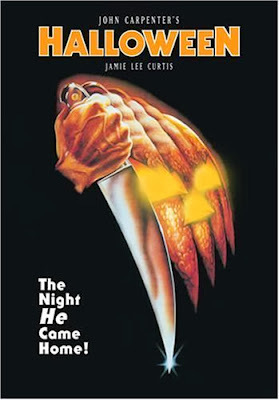 It just had to be John Carpenter's original classic that set the criteria for the slasher genre as a whole. My only problem now is that having seen the first I want to watch the rest! 6 year old Michael Myers brutally stabs his sister to death on Halloween in 1963. 15 years later and he escapes from the mental asylum he has been kept in by Dr Sam Loomis (Donald Pleasence). Loomis upon discovering (and witnessing the escape) races to Haddonfield; Myers home town where he is sure the killer will return to. Meanwhile nerdy teen Laurie Strode (Jaime Lee Curtis) is set to spend her Halloween babysitting in what she thinks will be a normal night, but Myers has returned and for reasons unknown he has singled her out as his main target, killing anyone that gets in his way. Eventually arriving there himself Loomis sets out to find and stop Myers who he considers to be evil incarnate. I have always loved the Halloween films but I was taken back a bit by just how good this film still is, it really holds up well in many respects and races along far quicker than I remember. 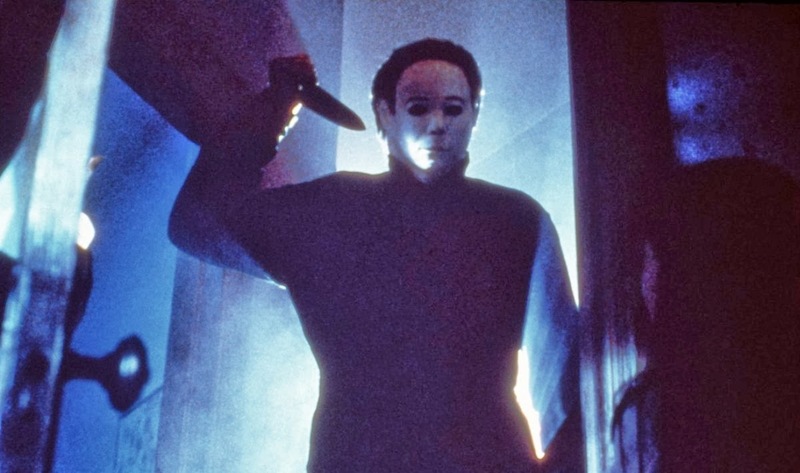 Michael Myers is a very iconic horror figure; the boiler suit, the expressionless white mask (as everyone knows was actually a William Shatner mask painted white), and his giant carving knife. The shots shown from Myers perspective with his heavy breathing echoing around are absolute genius. People always forget how little blood and gore there is in Halloween, apart from a few splatters of blood on clothing there is no blood at all. You could include the knife wound Laurie sustains but it does just look like someone has drawn a red line on her arm with a marker pen (this was an indie film after all). The body count is small but inventive, some iconic deaths here such as someone being pinned to the wall by a knife through them. I am a fan of Rob Zombie's version of Halloween, certainly the second one, he is not shy when it comes to gore but here the frights come from the presence of Myers. Stalking Laurie he initially just keeps popping up in the background standing out like a sore thumb but at least he is dedicated to his stalking. Seeing it again I never recalled being shown such a good shot of his face under the mask as I did here, memory changes your perception I guess. Myers is awesome and a great movie slasher icon but Halloween is not scary any more. As the heroine Curtis is much better than I remember as the nerdy girl even if she does scream far too much. Pleasence is perfectly cast as Dr Loomis, he steals all his scenes that Myers is not in and is the perfect foil to the killer. In many ways he is the exact opposite to him and so is his perfect adversary. Myers is young, strong, silent, Loomis is old, weak, very talkative. Both are dogged and relentless, driven by an inner purpose. As Myers hunts Laurie so too does Loomis hunt him. He knows more than anyone in the world what evil has been freed and feels responsible as well as convinced only he will be able to stop him, he is almost crazy himself in his pursuit. Also as a fun side note every single Halloween film Dr Loomis appears in he spends the majority of the film in completely the wrong place, only coincidentally bumbling into the correct location at the end. For someone who says he knows Myers better than anyone he sure has trouble second guessing him! The iconic slasher figure, that fantastic theme tune, the invention of the staples of the slasher genre (such as only a virgin being able to stop the killer) all roll together to make a film that just cannot ever be seen as bad, it is a giant among horror films and one of John Carpenters best ever films, and one of the best horror films ever made.